In 1968 Arabia introduced beautifully designed pattern called 'Koralli'. 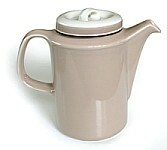 It was made in stoneware with hand painted decoration underglaze in tones of light milk- chocolate, gray and dark brown. The designer of this pattern Ulla Procopé (1921-1968), who worked for Arabia from 1948 to 1968. The shape of each individual dish in 'Koralli' pattern is similar to 'Ruska' pattern. Ulla Procopé passed away suddenly soon after 'Koralli' introduced to the public. The production of 'Koralli' last just couple of years.